This report assesses the impact of our alumni on governance and democracy, principles which lie at the heart of the Commonwealth. The report takes as its main source the responses of alumni who reported having impact in at least one of four key priority areas for development – and democracy: Governance, International Relations, Social Inequalities and Human Rights, and Conflict Resolution/Humanitarian Assistance. 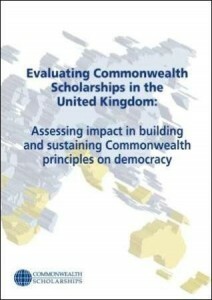 In addition, the report includes indepth interviews with four former Commonwealth Scholars and Fellows.